Bonus: I’m not sure exactly what this entails but I feel like I would excel at it. 19 Responses to Friday Follies: Hold Tight! Could that be the last Time Rice played Texas and won? We were there and I seem to remember the goal posts coming down. Dagobert, it might also be the prior year. 1994? When Rice beat Navy to clinch its first winning season in forever. We tore the goal posts down then, too. And made the CBS Evening News. Sorry, Dagobert but we beat Texas on a rainy Sunday night so that would not be it. It does look like we won a game and the goalposts were coming down. I did not look up the year but I would bet in the mid-80s, possibly when Rice was in the midst of a three year run where the record was 1-32. Could have been ’85 when safety, and financial, concerns prompted the Campus Police to crack down on such things. Batons were used against students and that created a huge backlash. That is the tearing down if the goalpost after Rice broke s long losing streak in 1983. Rice’s 22-21 win over Southwestern Louisiana on Sept 24, 1983, which broke the Owls’ 15-game losing streak, was a night game. The Sept. 30 Thresher articles (on pp 1, 8 & 14) and a front-page photo describe the south goalposts being taken down. 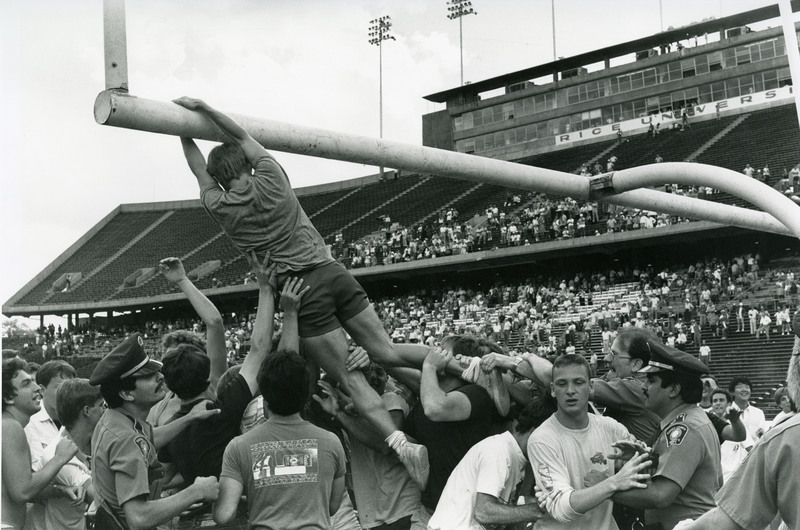 (https://scholarship.rice.edu/bitstream/handle/1911/67553/thr19830930.pdf?sequence=1) The photo above shows the north goalpost and looks to be a day game, so it was probably not taken at the 1983 win. The goalposts also came down after Rice’s next win, a 36-19 thrashing of Lamar on Sept. 22, 1984. But that was also a night game, as shown in a photo in the Sept. 28 Thresher. Alas, it was his and Rice’s only victory that year. Cops rockin’ some sweet ‘staches. I was in the MOB with Syd and I seem to remember it happening, too. And it was a day game. But for some reason I thought it was beating Texas. That didn’t happen until the 90s. 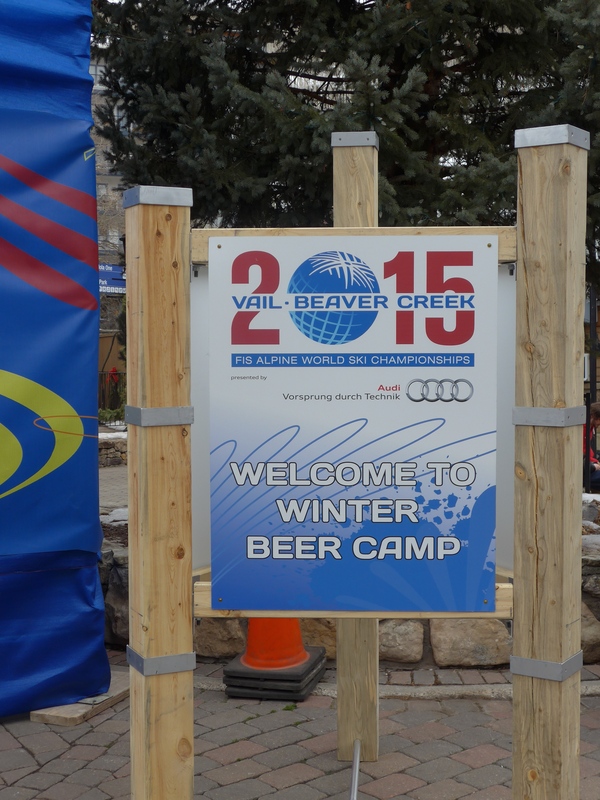 Bonus: I approve of the beer camp sponsor. The cops are Harris County Sheriff’s Deputies, not Rice Police, by the way. A completely-indecipherable t-shirt (although someone visiting here may recognize it), and the group of people in the stands just above the well-grasped ankle – women in long skirts and men wearing ties. We are likely seeking the lone day-game-first-victory-after-a-long-string-of-losses. I do seem to remember a victory after which the south goal post was heavily guarded, and the students simply sprinted for the unguarded north end zone. But I cannot recall what that game was. No mention of the goal posts coming down in the Thresher that reported the victory over Baylor in ’78 (only home victory that year, and this after four straight losses, and a day game). I’m pretty sure I remember this and it was in the early 80s because I got here in 1980. The Owls went 0-11 in 1982 and 1-10 in ’83 and ’84. My guess is this was ’83’s only victory, Sept. 23 vs. Louisiana-Lafayette. Or it could have been the Lamar game in Sept. ’85 or the first SWC victory since 1981, TCU in Oct. 85. Did you know there is an online Beer-Bike shirt gallery? The things you find online these days! (No, the indecipherable t-shirt is not in there). I cropped the image down to the back of the t-shirt and did a google image search with no luck. The goalpost incident had not happened when I graduated and moved in 1982. The indecipherable T-shirt looks like it’s some sort of E.T. shirt — look at the hand in the image closely. The script above and below the image suggests to me some sort of attempt at an alien script. If it’s ET related, that would also suggest an 1982 date. I have two friends in the photo who arrived at Rice in the fall of 1985, and one of them says this would be the win over TCU that fall. Coming on the heels of the students’ goalpost takedown after the Sept 28 win over Lamar (a night game, see the Oct. 4 Thesher for story and front page photo), the TCU post-game celebration resulted in several student injuries as the Sheriff’s deputies tried to “defend” the metal tubes. BTW, Rice won its next game, too — a last-second win over Texas Tech in Lubbock on James Hamrick’s record 57-yard field goal (https://www.youtube.com/watch?v=_bGWSWUiqlk) — to get to a 3-3 record, a level of success that wouldn’t be surpassed until 1991.